This week I have a simple but effective 2v1 drill. 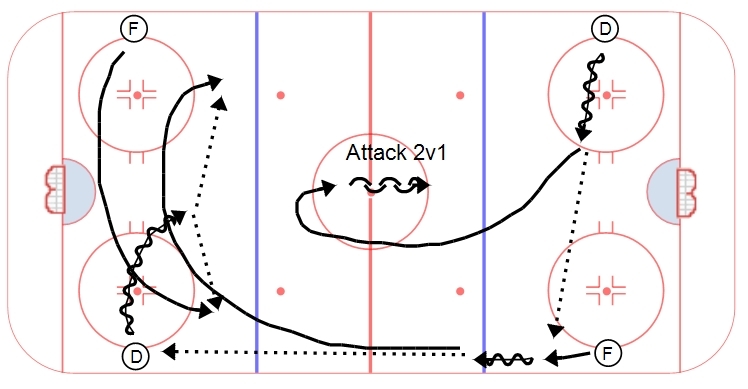 The BU 2v1 incorporates speed and passing for forwards and passing, distribution and skating skills for defensemen. A defenseman starts with the puck, skates out to the center of the ice and passes to a forward. The forward fires a hard pass down to a D on the far side of the ice and then swings low into a support position. At the same time, a forward steps out behind the D and presents an option. The D who made the first pass gaps up. The two forwards then receive a distribution pass from the D and attack 2v1. The D can be introduced as a third option (activation/follow the play). The drill then starts again from the other side on a whistle. Forwards should focus on puck support and next play thinking – creating options for their teammate with and without the puck (drive the net, puck carrier drive, cross and drop, etc). D need to maintain good gaps, strong sticks in passing lanes, and try to influence the play into tight areas.